1953 represented a radical shift in Studebaker design philosophy, all started by Raymond Loewy and his design team. Bulbous, ungainly profiles were replaced with sleek, low slung bodylines that stayed current for 11 years - until the GT Hawk finally went away after the ’64 model year. Lowey, a Frenchman, was also responsible for imparting sleek Euro form into many stylish household goods of the mid-century like the Coca-Cola dispenser, Sears refrigerators, fancy glassware, and many corporate logos. It’s lost a bit of its luster with age but the patina game is very strong over those timeless lines. 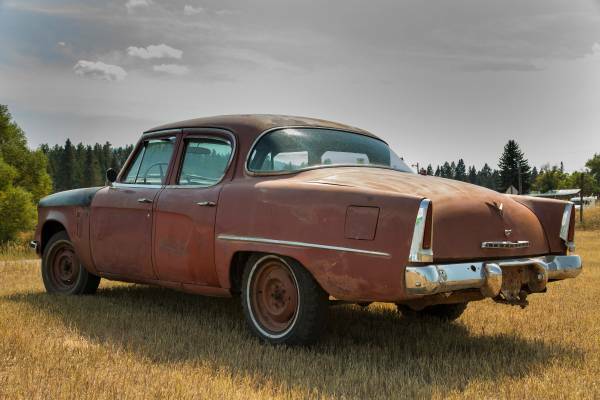 Find this 1953 Studebaker Champion for sale in Kalispell, MT for only $2,000. This post is part of DT's 2016 Birthday Celebration of 100 cars; enjoy the ride! 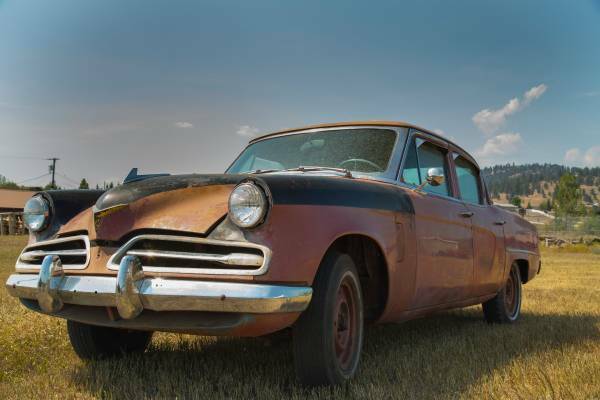 Studebaker powertrains are legendary in their durability, aside for the lone OHV 6. The, however, flathead six in this Champion is one of the smoothest and quietest running motors in history with a long service life. The smoke that the seller mentions is probably the fault of valve seals but even if it’s something more serious, a Studebaker six is a fairly straightforward rebuild. I’d be willing to bet that after a few miles of driving it as-is with a few changes of fluids, this thing would be pretty sleek and iconic transport, or a great starting point for a Carrera Panamericana build. If it lived its whole life in Montana (dry climate and no salt used on the roads)it probably has very little rust. Although that driver's side quarter panel looks a bit suspect. Restore it or maybe an LS1/6 speed swap but keep it patinamobile on the outside? The sedans are shortened wheelbase cars (114" for the sedans vs. 120" for the coupes) that are taller and boxier than the coupes, and don't have anything near the elegant proportions of the longer wheelbase cars. The proportions of the sedans are closer to a tri-five chevy than a Loewy coupe, as evidenced by the way Studebaker modified them for 1956-1958 with new front and rear sheetmetal, http://momentcar.com/image-modelYear/14572-1956-commander-2.jpg.html. Of course, the coupe you can buy for $2000 will be much closer to yard art than a working car.